Power and speed in the golf swing comes from the kinetic muscle chain reaction from the feet up through the torso, down through the forearms, and wrists. But the main power supply comes from the Quad, abdominal, forearm, and wrist muscles. 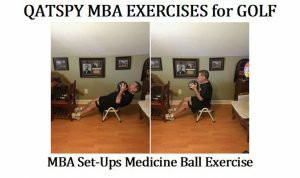 Simple Medicine Ball exercises for golf is what I refer to as Medicine Ball Aerobic MBA exercises for power and speed. These Medicine Ball exercises for golf not only consist of these four muscle groups, but the majority of the 640 other muscles in the human body related to the golf swing technique. 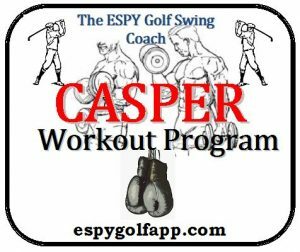 I have four particular medicine ball exercises for golf that I perform daily, even if I don’t perform my CASPER Fitness Workout. These four MBA exercises allow me to maintain my flexibility, power, and speed in my golf swing sequence, but also to avoid injuries. While I’m using the MBA workout to work my entire body with these series of four medicine ball exercises for golf, I’m focusing on the powerhouse muscles of working my quad, abdominal, forearm, and wrist muscles. These muscle groups are critical to the golfer trying to create power and speed in their golf swing sequence. 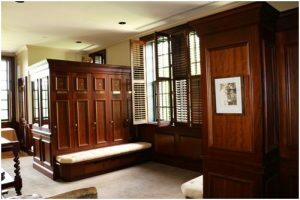 But, even more important, is that my MBA exercises reinforces my muscle memory for my golf swing coaching technique. The more the golfer can visualize these muscles and how these muscles work in the golf swing sequence, the easier the golfer can transition their golf swing mechanics from the practice range to the golf course. The Medicine Ball Aerobic exercises regimen that is a part of The CASPER Fitness Program focuses on strengthening the wrists, forearms, core, and quads muscles. Here’s the greatest advantage of the MBA, even if you don’t have time for your full workout, rehabbing, or just starting an exercise program. The MBA exercises is a great alternative to a full body workout. One objective that I follow daily is to workout using my MBA exercises for power and speed, but also to avoid injuries. The MBA exercises are critical to activate what I refer to as my critical path muscles used to execute the classic golf swing. 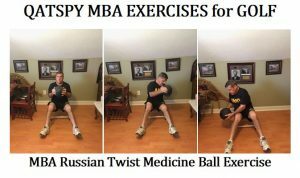 The four MBA Medicine Ball Aerobic exercises that I use in my golf workout consist of: MBA Stocking the Shelves, MBA Sit-Ups, MBA Russian Twist, and MBA Burpee, as illustrated below. 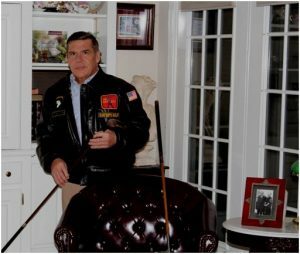 The photographs above are illustrations of me performing the MBA Exercises for my golf swing to maintain flexibility, strength, and muscle memory. Another exercise that can be included in your golf swing workout is to use ONE (1) ankle weight and attach the ankle weight to the lower forearm area, like where the wristband on a pair of boxing gloves would be, and run through the ESPY Golf Swing sequence. I have been working out with the CASPER (Cardio, Aerobic, Strength, Plyometrics, Exercise Regimen) Fitness Program since I was 12-years old. I’m now over 55. Now I use a stool because I had a hip replacement, I don’t want to place any additional stress on my hip joint. I also try to incorporate a few Medicine Ball Aerobic exercises in with a few of my Yoga exercises between CASPER exercise elements. 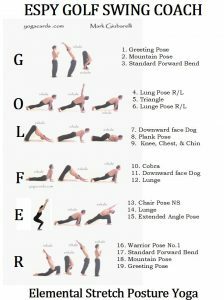 Yoga provides flexibility and balance benefits for the golfer’s golf game. I use my rest periods in my CASPER fitness regimen to perform a series of Yoga exercises from the chart below. NOTE: In the MBA Burpee, I now just spring upward or lung upward instead of jumping. I just want to come off my heels and just get on my toes instead of jumping in the air like I did before my hip surgery. The benefits of fitness, and particularly Yoga, are that fitness and yoga improves blood supply to the brain by reducing the aging process and reducing impairments, such as Dementia and the onset of Alzheimer’s and PTSD, especially in Veterans. 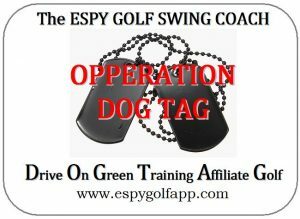 I developed, FREE of charge, Operation Dog-Tag to help get Veterans and civilians involved in golf as a sport, social activity, and as a form of friendly competition. Golf, with yoga, has shown to benefit Veterans dealing with PTSD. 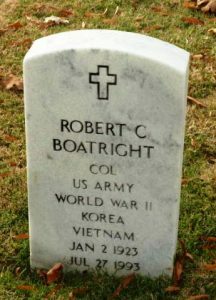 This also gives other people an opportunity to show their appreciation to our military and Veterans and what they have done to provide Liberty and Freedom we all enjoy. To learn more about Operation Dog-Tag, please use the links below. I have also included a FREE SR925 Diet program that anyone can access, where I lost over 40 pounds and 7.5-inches in my waist within nine-months. I went from 37.5 inches in November of 2014 down to 30.0 inches in July of 2015 with the effective SR925 Diet Program that I developed, see detailed below. 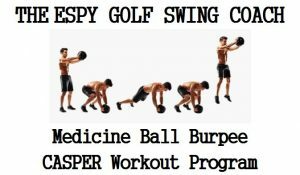 A part of the CASPER Fitness Program are golf exercises refer to as the MBA Exercises with medicine ball – that includes Stocking the Selves and medicine ball exercises Burpees. For endurance and a full body workout, I also include a boxing glove-punching bag exercise. 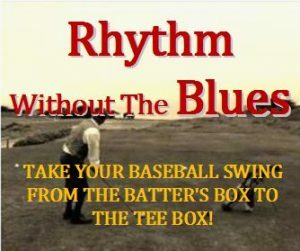 ESPY Golf Swing Coach- ESPY Golf App Develops the golfer’s Rhythm w/o creating the golfer’s Blues. The ESPY Golf Swing helps the golfer establish the correct wrist action in golf swing demonstrated by David Duval in an interview with Charlie Rymer on Golf Channel. 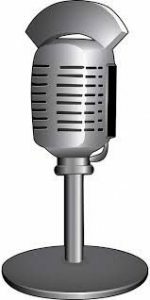 I would like to recommend an interesting radio program that I regularly listen to originating from my home state Arkansas on my I-Heart Radio app on KARN 102.9 FM station, out of Little Rock. They air a golf show called Arkansas Fairways and Greens, at 7:00 AM CT each Saturday morning, hosted by Bob Steel, and co-hosted by Jay Fox and Charles Crowson. Bob occasionally as has his guess Alex Myers with Golf Digest and Ron Sirak with Golf Channel. 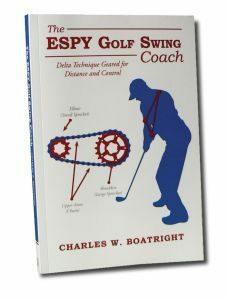 I was interviewed on his show about my book, The ESPY Golf Swing Coach. This show is worth tuning into for golf news and information. Jay Fox is an Administrator with Arkansas State Golf Association that discuss amateur golf and rules of the game. Check out my full library of BLOGS @ www.espygolfapp.com/blog or purchase your copy of “The ESPY Golf Swing Coach” @ www.espygolfapp.com/store. Once you learn WHY, you don’t forget HOW! Two decisions that you can make for yourself and your kids are to get a copy of my book and place the book and a golf club into their hands. You will never look back, but only forward. You will not miss with this for yourself and/or your kids. 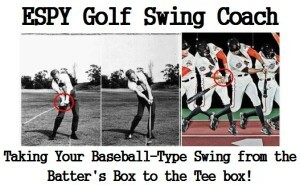 Until next time– Be Synched, Tee-to-Green, with The ESPY Golf Swing!